Agile Coach Camp US is in New York, at Spotify (!). It’s my second Coach Camp. Between seeing lots of familiar faces from my first and elsewhere (plus lots of new ones), getting and giving lots of hugs, and not needing a hotel room in order to attend or even to take an afternoon nap, I feel completely at home. These are my people, and to get to spend time with them as a newly independent consultant is imbued with possibility. If we find our interactions leading us to wish we could collaborate professionally — well, now we can. And then Ryan Ripley and I asked for help with our new talk, “The Care and Feeding of T-Shaped People”, which’ll debut on Monday at Big Apple Scrum Day. We got lots of thoughtful and thought-provoking suggestions, some of which will make it into our 45-minute session. Next time I’m lucky enough to have several people willing to help design a conference presentation, I’ll try to involve them earlier. Tomorrow I plan to join Markus Silpala’s session, which is also aimed at giving folks who don’t usually write code (or haven’t in a while, or ever) a taste of what it’s like. All of us are grateful Markus is recovering well and is back with us. 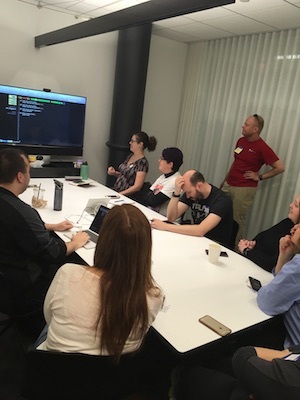 Update: I did join Markus’s session (pictured), as did several other skilled programmers and technical coaches, so the learnings came from several directions. It was great.